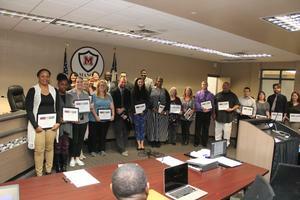 As part of Manor ISD continued effort to celebrate the hard work that is being done throughout the district, each principal was asked to nominate one teacher from their campus to be recognized at the November School Board meeting. Congratulations to all those chosen! Mr. Jeffery has a great rapport with our scholars and knows the life changing effects when scholars are successful academically and socially. He is an accomplished teacher that has been a positive addition to the campus culture. Mr. Jeffery believes the parent involvement plays a major role in creating a safe learning environment and scholar success. Recent Teacher of the Week, volunteers to cover classes when needed, and gladly performs any extra duties to support the scholars. Ms. Branum is dedicated to growing students by creating a positive culture in the classroom and developing relationships with her students. She has really stepped up during 4th grade PLC's in developing lessons that are engaging and aligned with the IB curriculum framework. Ms. Branum has established a great relationship with not only the parents in her class, but also with the community. Several parents have commented on how they really enjoy her positive outlook on student learning. Ms. Branum is a second year teacher; however she has been very effective and is a natural born teacher. She is destined to be a leader in the future. Ms. Ward offers a bimonthly Art club, which students look forward to participating in and show off their creations. Ms. Ward is able to teach students skills and build upon their talents. She frequently brings in discussions on how Art relates to math and literature. Ms. Ward is willing to help any staff member who needs assistance in making art for their classroom. She keeps up with a main hallway bulletin board that changes frequently. She is reworking our upstairs’ hallway "museum". Ms. Ward is part of our PTA and shows up at our monthly Fine Arts showcase as well as any event that needs assistance. Ms. Haywood’s influence on the exceptional academic growth of students is reflected in the scores of their Curriculum Based Reading Assessment 1. They were the highest in the school and district with 38% Meets. Due to her excellence in improving students reading scores, Ms. Haywood is recognized by her peers for the academic growth of her students. I have received positive feedback from parents of students in her class about her thorough preparedness for parent meetings, which gives them very specific information on their child's strengths and needs. In addition, she provides them with what she is doing to assist their children in the classroom, and how they can help at home. Ms. Medrano is instrumental in providing academic support to students in grades 3 through 5. She assists with hands-on experiences that are researched-based as well as projects aligned to the New Tech model. All the while Ms. Medrano provides an excellent library experience for all grade levels. Ms. Medrano provides resources for teachers to use in their classrooms and collaborates with them to do lessons on topics of the teacher's choice. Our library is a place where teachers feel welcomed and safe to explore cross-curricular activities thanks to Mrs. Medrano. She partners with our PTA and together they will be hosting a Polar Express event for students and parents in December. They are also currently hosting a book drive so that all students will receive a wrapped book during this event. Ms. Thomasson students consistently demonstrate 40% or better in MEETS and MASTERS for district and campus 5th grade Math assessments. She hosts vertical math planning for grades 3rd-5th twice weekly. Every 3 weeks, Ms. Thomasson makes it a point to connect students and parents when a student demonstrates mastery of their learning. As a rookie teacher, Ms. Chun is dedicated to helping our scholars develop reading and writing skills in English I and English III through culturally relevant projects that make cross-disciplinary connections to other subjects and contemporary topics! Ms. Chun is an active participant in PLCs and meets regularly with her mentor teacher! Ms. Chun has stepped up to not only lead our campus Student Council but is also helping coordinate efforts for prom and helped organize our first ever homecoming festivities! Mr. Fettig works with students from any academic background and ensures that all of them learn to maximum! He presented at PLCs and helped other colleagues grow professionally. Constantly works with students and parents and sends weekly updates to parents. Very accurate when working with student data and reflects on data analysis weekly. Ms. Settles’s 1st grade students continue to improve in academics as well as in social emotional learning. Her students are lucky to have her as their teacher. Ms. Settles serves as the First Grade Chair and Lead Teacher. The First grade PLC team runs like a well oiled machine. Ms. Settles serves as a calming, gentle force and wonderful model for the First Grade team. Mr. Reyes has made vast improvements in the Science department for students. He works very hard every day to ensure student success and a love of learning. Mr. Reyes has been a campus leader for over 10 years, working with parents and the community as an educator and a coach. Mr. Reyes is never absent! We can always count on him to be at work every day, on time, ready to do his absolute best for our students. Mr. Polk has greatly influenced the exceptional academic growth of students here at MEA. He works diligently with students by meeting them where they are academically and planning a path for success for them in his classes. Mr. Polk is non-judgmental, empathetic and can relate to many of his students and their situations. He is able to make connections with students that truly inspire them to be successful. Mr. Polk is currently working on his principal certification and his program involvement has required many efforts of him that have had such a great impact on our campus culture and on the professional learning of colleagues. Polk has mentored novice teachers, developed strategic plans to support student achievement, supported administration in many areas and implemented a blended instruction fast track for students who possess the work ethic to perform well even with a heavy volume of course work. He is constantly collaborating with others to ensure that all students needs are being met. Mr. Polk prides himself on being able to build effective relationships with students, parents and other stakeholders. He reaches out to families to share great news about student progress, and has made himself available to demonstrate to parents and others how students can use Edgenuity effectively. Mr. Polk is a true team player. He takes on many additional tasks to support the students and the leadership team. He empowers students to take control of their own academic journey and he shares his story of personal struggles, which really allows him to make connections with the students and encourages them to push forward. These are all reasons why Mr. Polk is identified for teacher recognition. Mr. Monreal has very high expectations for his students and he pushes his students to be the very best in his class. He does an amazing job of providing immediate feedback to, as well as modeling for his students how to problem solve and learn from their mistakes. Mr. Monreal has told his students that we would like them to acquire math skills that will take them beyond 5th grade and support them in their future endeavors. Mr. Monreal has provided professional development to his fellow colleagues as well as shared best practices with fellow teachers who seek guidance in improving their craft. Parents appreciate Mr. Monreal's dedication to help their child to excel in math. Over the last 4 years, I have had a chance to watch Mr. Monreal grow as a teacher and perfect his craft. I appreciate Mr. Monreal's desire to grow as a professional and be willing to support his fellow colleagues. Ms. Bishop has demonstrated her passion for our scholars academic growth through the countless hours she has dedicated to make sure our scholars receive a strong instructional foundation. She is not only MSHS Teacher of the Month, but she was also selected for Students Choice Teacher of the Month. Ms. Bishop continues to set the bar of expectations high for her students, colleagues, and campus atmosphere. Mrs. Bishop is truly a champion of all scholars on our campus. Her passion for learning and guiding new and veteran faculty is evident by the leadership role she has undertaken. Ms. Martin goes above and beyond to plan rigorous and relevant lessons for all of her students. She collaborates with teachers in her team as well as other grade levels to ensure that all students are making progress. Mrs. Martin communicates with parents weekly and creates activities for her students to build a strong connection between our school and the community. Ms. Mitchell builds strong relationships with her students, which has increased their performance on district assessments throughout the current semester. She is our GEAR UP coordinator and works hard to include staff in all things GEAR UP. Mrs. Mitchell has used this as a platform for Kids Feed Kids. Ms. Mitchell has been able to solicit food and backpacks from community members as well as people outside of the community in order to fill backpacks and bags with food for kids in need. Mrs. Mitchell has gone to BME to meet with Janet Ward to see how they got their SOS program off the ground. Thanks to her efforts and hard work, Decker Middle School now has a similar program called Kids Feed Kids. Ms. Khan teaches Pre-AP Physics for freshmen and Anatomy and Physiology as well as Dual Enrollment Physics through the OnRamps program, which helps our scholars earn college credit. She is approachable and friendly to everyone she meets and makes herself available to support Titan scholars. She also supports teachers by serving as a mentor to new ones - supporting and encouraging them effortlessly. Her contributions during PLCs have helped our science department become more coherent and cohesive. Ms. Khan’s dedication to our scholars extends beyond the classroom as she serves our campus as the sponsor of two major organizations, Health Occupations Students of America and Tech Girls. Ms. Martin is data driven, and innovative with her instruction. She is constantly differentiating her lessons to close achievement gaps and supporting the campus culture. Ms. Martin has gone above and beyond with planning interventions for her students and in addition supporting the LOTE Team, PBIS/CKH Team, and works closely with the campus leadership team. Ms. Martin helped implement the campus new Digital Tardy & Incentive system-HERO. She helped train the entire staff on the program and monitors the progress for the entire campus per the data reports. Ms. Martin is a true advocate of ensuring MHS is thriving, and that our students and staff are continuing to excel!